Jonathan Rea (Kawasaki Racing Team WorldSBK) has made history once again at the Circuito San Juan Villicum, winning the first ever race of the MOTUL FIM Superbike World Championship on South American soil in authoritative fashion. Marco Melandri (Aruba.it Racing – Ducati) and a scintillating Toprak Razgatlioglu (Kawasaki Puccetti Racing) completed the Race One podium. With Rea’s win, Kawasaki have now officially won the manufacturers title for the fourth year in a row. After being clearly outpaced in qualifying by the veteran Italian rider, Rea shot out with a vengeance at the lights, taking the clean line through turns 1 and 2 and quickly opening a gap with the riders behind. Tom Sykes (Kawasaki Racing Team WorldSBK) quickly moved into third, with good starts from Alex Lowes (Pata Yamaha Official WorldSBK Team and Chaz Davies (Aruba.it Racing – Ducati) also pushing them up the ranks. There was disappointment for the home fans however, as Leandro Mercado (Orelac Racing VerdNatura) crashed out whilst riding inside the top ten. Rea’s prediction on Friday was that the race would be decided inside the last 3-4 laps, with big questions marks over how the World Superbike machines would respond to 21 laps around the pristine Argentinian track. But if anything, the champion was more dominant than ever here, riding at a breathtakingly consistent pace with barely any laps above the 1’40 benchmark, even in the final laps of the race. With Rea untouchable and Melandri sitting comfortably in second, all eyes were set on the scrap for third position. 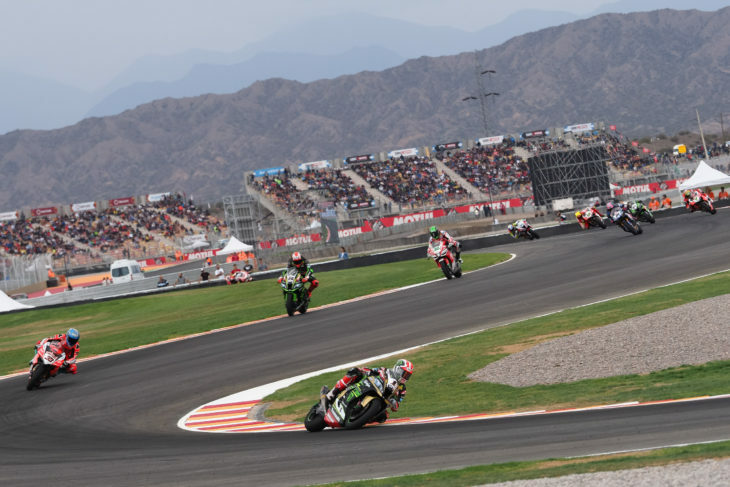 There’s no lack of passing points at the stunning Argentinian circuit, and that showed in the first race held here: Laverty moved past Sykes in lap 5 on the back straight, whilst a fourway tussle behind for fifth saw Lowes fall back behind Razgatlioglu, Davies and Xavi Fores (Barni Racing Team) in short succession. The four caught up to Laverty and Sykes shortly after: the Turkish rookie bested Sykes in lap 13 and the Aprilia man one lap later, with Davies crashing and skidding out as he also attempted to pass Sykes, with raindrops making an appearance at the midway point of Race One. With Rea crossing the line a full nine seconds ahead of Melandri, a fantastic Razgatlioglu managed to keep hold of third and clinch his second World Superbike podium position, with Fores climbing to fourth in the penultimate lap. Laverty was fifth at the flag, with Sykes behind in sixth and Lowes crossing the line in seventh. A difficult race for Michael van der Mark (Pata Yamaha Official WorldSBK Team) saw him cross the line in eighth position, with Loris Baz (GULF Althea BMW Racing Team) managing to outsmart Leon Camier (Red Bull Honda World Superbike Team) at the final turn to steal ninth position. Special mention for the three WorldSBK debutants here in Argentina: Florian Marino (TripleM Honda World Superbike Team) met the flag in 11th position, with Maximilian Scheib (MV Agusta Reparto Corse) in 13th and Gabriele Ruiu (Team Pedercini Racing) in 14th, making the 18-year-old Italian the youngest point scorer in the championship’s history. Race One closes day two in Argentina and leads us into the final day of the Motul Argentinian Round. What twists and turns will we see in Race Two?